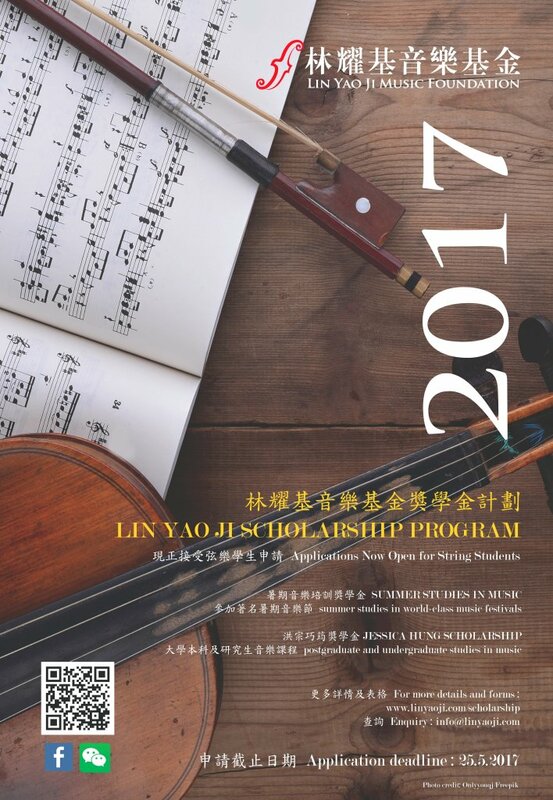 To extol and commemorate Professor Lin Yao Ji’s legacy and lifelong work, the Lin Yao Ji Music Foundation has launched the Lin Yao Ji Scholarship Program in June 2014, through which it aims to award generous scholarships to talented and deserving young musicians in China (including Hong Kong and Macau). The Foundation has provided a limited number of scholarships annually, beginning in the academic year 2014/15. The objective is to promote excellence in classical music performance and composition by financially supporting students with the potential to attain exceptional achievement in the music and arts profession who have gained acceptance to eligible learning programs at world-class festivals and summer schools overseas recognised by and affiliated with the Foundation. Importantly, the Scholarship also aims to encourage young established musicians to give back to their home communities through taking on an ambassadorial role to promote cultural exchange between our Chinese students and their foreign peers, and to bring back and share their education and experiences and to promote the classical arts upon completion of their studies abroad. Each Scholarship will go towards defraying tuition and accommodation costs, taking into consideration applicants’ individual financial circumstances. The Foundation is pleased to enter into a long term relationship with the Verbier Festival, one of the most respected summer institutions for advanced string players. The Foundation and the Festival both share a common belief in the potential of Chinese string players, and are committed to providing the best learning opportunities that come with an immersion program similar to the type for which the Festival is renowned for. The Foundation will provide one to two scholarships each year to qualified candidates who are residents of China (including Hong Kong and Macau) to attend the Verbier Festival. Ziyu Shen, a Shanghai-born violist who has won critical acclaim in China and the rest of the world at the age of 16, has been selected to study at the prestigious Verbier Festival Academy in Switzerland during Summer 2014. The New World Scholarship for Summer Studies in Music was awarded during 2014 to 2016 and is supported by the New World Group Charity Foundation, aiming to provide scholarships winners to attend summer studies in world-class music festivals. Established in 2015, the Jessica Hung Scholarship (JHS) supports local and mainland music talents to pursuing postgraduate and undergraduate studies in music. The Foundation is prepared to accept applications for financial assistance on a case-by-case basis, to go towards defraying tuition and accommodation costs, taking into consideration applicants’ individual financial circumstances. 2017 application is open now and deadline on 25 May 2017.